And why is Ada more than just a robot? Because Alex goes to great lengths to unlock her free will. Something that is against the law and puts them both at great risk. I downloaded the first issue of this comics series on a lark, just to try it out, and I found myself gobbling them down so fast I could hardly stop. I could've gone ahead and bought the first collected volume (issues 1-5), but I had already read 1-3 in single format. I had to have MORE MORE MORE, and rather than wait for volume 2 (March 2015), I downloaded all the singles...issues 1-12 because I couldn't stop reading. What makes this such an engaging story? Probably the moral struggle as well as the longing for companionship. Alex is a fairly low key, everyday kind of guy. A worker bee and regular Joe in a Jetsons kind of future. He's lonely after a failed relationship, and he can't quite stomach the idea of a robot completely dependent upon his permission to do anything. He'd much rather Ada be able to think on her own. To be a companion rather than a servant even though the world he lives in is full of androids and it's considered dangerous and reckless for them to be sentient. As the political and social tension surrounding Alex and Ada rises, so does the tension within the issues. I am HOOKED. Least favorite part? The artwork. 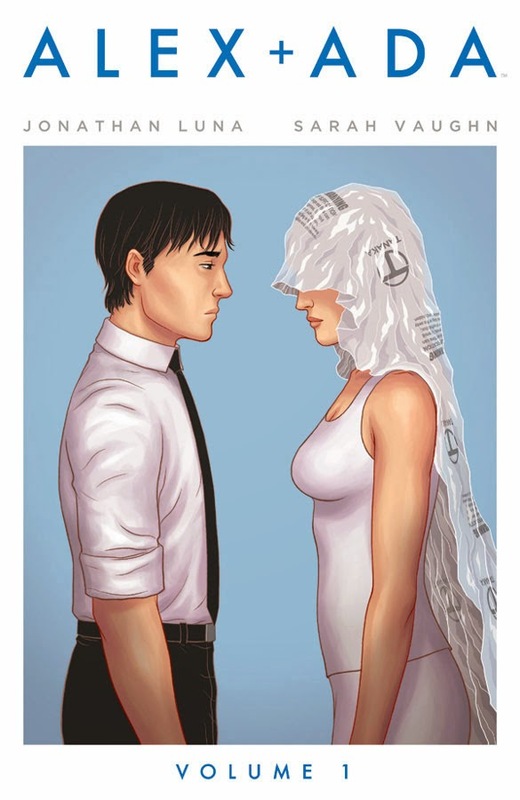 Now, before you turn tail and run, the artwork in Alex + Ada is very plain. There are no frills, and the environment seems very sterile. It's fitting since Alex has led such a low-key colorless existence. Until Ada arrives to shake things up. You can see a bit of what I'm talking about in the panels up above. While the artwork style isn't my favorite, it's effective storytelling, and that's a much bigger concern for me than whether or not it's pretty. It's successful. 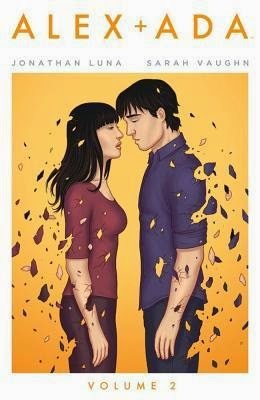 If you want to be sucked into a story, you need to start on Alex + Ada. It's still going, so there's more to enjoy! I definitely want to get this! I sadly only heard about it after I bought a few comic books with Christmas gift cards, so will have to wait until I allow myself to buy more! I need another series like a hole in the head. Good thing I like holes in my head. Anyway, your other post already made me add this to my wish list, but I believe you just made that wish a little more urgent. And yay! I'm glad to enable. I've just starting dipping my toes... well maybe one toe... into the world of comics/graphic novels... having only read - and enjoying! - "Saga - vol 1." I might have to add this series to the list of what to try next, so thanks for the recommendation! Oh yeah! I forgot it was in that Humble Bundle. I think you'll really like this one, Sarah! Can't wait to read this! It looks so good! I may have to actually buy it, just cause it looks really fantastic and I don't want to wait for my library to get it in. Do itttt! Dang libraries. No waiting! I hadn't heard of these before... I am going to for sure go and get them from the library! I hope you love them as much as I do, Angela! Do the panels reflect Alex's sterile existence getting shaken up by Ada? Or is it still plain? The style doesn't change dramatically. It's not like "oh, Ada's here! Now the art is prettier!" I think there's just more color that seeps in...partially because they're outdoors more and in new settings whereas before Ada it was very confined. This sounds like a really cute story which the moral questions could give a bit more depth. Very interesting! I echo DoingDewey above - she pretty much summed up my thoughts exactly. I'll try and find this one at the library.